The Fernandez Ranch located between Hercules and Martinez, California was acquired in 2005 by the John Muir Land Trust and opened to the public in 2008. The rolling hills, filled with oaks and bay trees make an ideal habitat for many of the Bay Area's well known mushrooms. Our December 12th, 2016 hike started with a quick review of most mushrooms life cycle with our naturalist and amateur mycologist, Damon Tighe. Fungi spend most of their lives in forms and places that are hard for us to detect. For a portion of the year they are microscopic spores waiting for the right conditions to germinate and grow into hyphae, small threads of cells that wind themselves around plant roots or through substrates like rotten logs. If they are lucky they'll meet another hyphae that is slightly different then themselves and they will mate forming mycellium that when conditions get just right will amass cells together and produce the fruiting body (mushrooms) to produce new spores to disperse out into the world. Leaving the parking lot we immediately found ourselves beneath a Coast Live Oak (Quercus agrifolia) whose duff provides provincial spaces for saprotrophic fungi, those that decompose. Mycena californiensis in troops pushed up eagerly between the leaves with its peachy orange caps, thin stipes and white gills with pinkish margins. Looking closer still we found leaves with wiry black stipes leading to the small white pleated caps of Gymnopus quercophilus. The coast live oak root system hosts many mycorrhizal fungi that collect nutrients for the tree and get sugar as a kickback. Under our first Oak we found some mushrooms in the Russula genus that have distinctively chalk stalks, usually white to creamy colored gills and a whole host of colors on their cap. Cutting through the cow pastures opened us up to a whole other group of fungi that are not commonly encountered in most of the Bay Area parks since cattle aren't consistently grazing there. A few grass associating fungi sprung up here and there, including some small puffballs, but the real stars of the pasture land were the fungi with a poop preference. Deconica coprophila sprung mightly from every corner of a cow pie. Its rusty orange caps when young get brown in age and beneath the cap are widely spaced dark gills attaching to the stem and running ever so slightly down the stipe (decurrent). From the same pile a Panaeolus genus mushroom also emerged. Undoubtedly hundreds of these two mushrooms have been consumed in vain by college students over the years. Further up another pie had a bright colored surprise, our first Ascomycete of the day. Most of the mushrooms we see are Basidomycetes, they form spores on club like structures called basidia. The Ascomycetes, also known as the cup fungi as many of them have a cup like shape, form asci which are these long tubes with the spores inside of them that can be shot out of the tube when conditions are right. 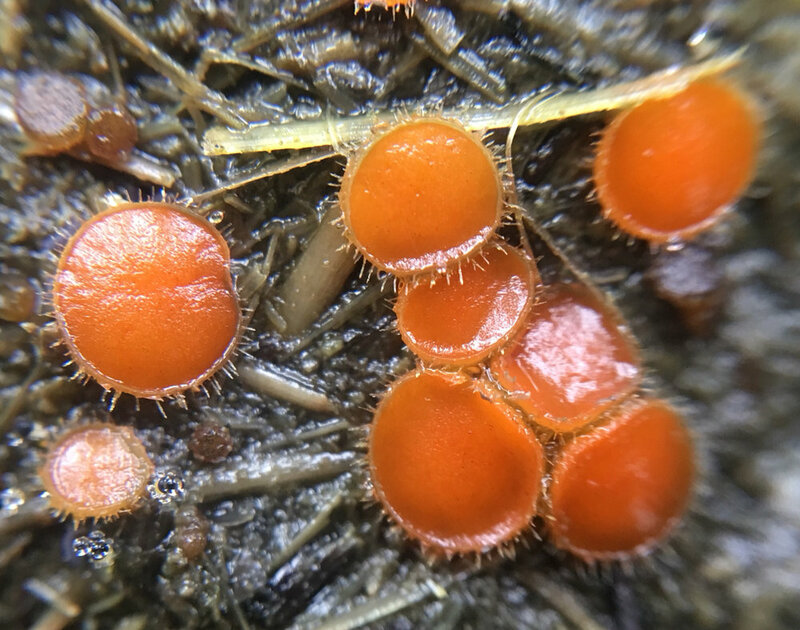 Many Ascomycetes are very small and this one required use of a hand lens or a clip on macro lens to be able to see the bright orange cup that had eyelash like hairs all around it. As we reached the in folds between the hills where the oaks and bay congregate we found piles of logs covered in Turkey Tails (Trametes versicolor) and the False Turkey Tail (Stereum hirsutum) that can easily be delineated from each other by looking and their undersides. Trametes versicolor has white pores while Stereum hirsutum has a smooth surface. On the Stereum we found Tremella aurantia, the aptly name "Witch's Butter" parasiting it. A few Golden Chanterelles (Cantharellus californicus) were found not to far away growing in association with one of the coast live oaks. This species of chanterelle is often called "Muddy buddies" or "Mud puppies" because they usually barely emerge from the ground and are usually covered in dirt and mud. A few paces to the east we encountered a few oaks with thick duff, but that were sitting on the edge of the forest, which tend to be prime spots for finding large fungi. At the base of these trees we found two boletes. Boletes are a taxanomic family of fungi then tend to have pores instead of gills, so underneath the cap you'll usually find something that resembles a sponge. We were lucky to see one of the few poisonous Boletes, Satan's Bolete (Rubroboletus eastwoodiae), which can be easily identified by its large bulbous stipe, red pores, pink to red cap and flesh that stains brightly when cut. The final destination of the hike was a large fruiting of Deathcap (Amanita phalloides) which is the mushroom responsible for the most deaths in California. Its an invasive species that most likely came on oak trees imported from Europe. It has found mycorrhizal associations with many our our native oaks. The mushroom contains a number of toxins, but the most notable is alpha-Amanitin which acts on RNA Polymerase II and stops the ability of cells to make new proteins. The poison is slow and most patients die over a three to seven day period. The poison is only transmitted via ingestion so handling the mushroom does not present any risk of harm. There is no antidote for the poison, but new procedures are emerging that can dampen the damage to the body and increase the rate of survival. The Deathcap is an elegant looking mushroom; the cap usually has a green shimmer to it, but white forms may also occur, the gills are white, young stems will display chevrons along their length, have a noticeable skirt and emerge from a thin volva in the ground. Given the right conditions they fruit in large numbers. The patch we observed had over 150 fruiting bodies. In between Deathcaps we found a number mushrooms in the genus Lactarius who all exude latex when they are cut. Observing the color of the latex and any color change it may incur, in addition to cap color and host tree are key feature for identifying species in this group. More mushrooms walks will be happening throughout winter, so please check our events page! If you have questions or comments, please leave them below. Become a Docent for Coyote Creek!